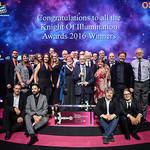 The annual Knight of Illumination Awards for 2016 took place this year at London’s iconic Eventim Apollo, Hammersmith on Sunday 18th Depetember. We are incredibly pleased to receive a £5,000 cheque at the ceremony thanks to a donation from Clay Paky. The company’s Chief Executive Officer Pio Nahum presented the cheque to John Simpson of White Light, who was standing in for lighting designer Rick Fisher.